These high quality 3D glasses are the perfect addition to your passive 3D TV or 3D cinema visit. They impress with their combination of elegance and sportiness, and are comfortable to wear. The somewhat wider frame counteracts the scattered light which can cause unwanted reflections in the lenses. Crafted with RealD theater technology, you can use our 3D glasses set in the comfort of your own home on all major Passive TVs, including SONY, Vizio, Toshiba, LG, Panasonic, Samsung, JVC, Epson and more. Lightweight and durable, these scratch-resistant, passive 3D glasses finally give you an immersive experience that's comfortable; unlike all those heavy, ill-fitting 3D glasses that won't let you enjoy an entire movie. When you want to experience 3D in total comfort, choose SOUBUN Passive Polarized 3D Glasses and enjoy watching movies in a breathtaking new way. 4 3D GLASSES FOR COMPLETE FAMILY SET - Each order comes with a set of four matching 3D glasses great for the entire family. Their sleek, black style and non-reflective matte coloring ensures they won't detract from the movie. TV & CINEMA VERSATILE COMPATIBILITY - These adult sized 3D glasses work with a wide variety of passive 3D televisions, including LG, SONY, Samsung, Vizio, Philips, Panasonic, JVC and so many more. HIGHLY-DURABLE LENSES - Crafted with strong, flexible plastic, our 3D lenses feature a superior scratch resistant coating to help them last longer and stand up to being worn over and over again. 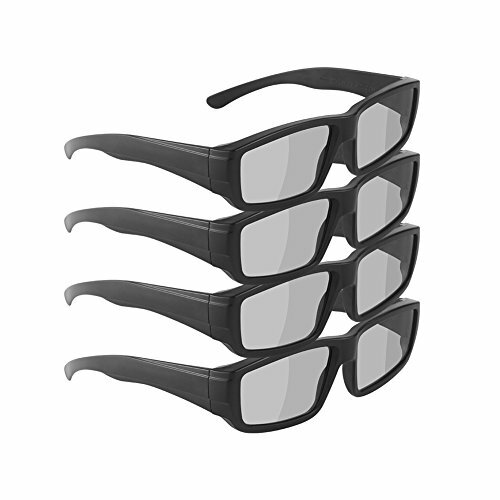 ENHANCED 3D IMAGERY - Boating passive circular polarized 3D lenses, our movie glasses offer a more crisp, immersive experience while watching your favorite ultra-high definition 3D movies. PACKAGE INCLUDES - 4 Premium Black Pairs of 3D Glasses, retail package, 4 glasses bags, and 4 glasses cleaning cloth. If you have any questions about this product by SOUBUN, contact us by completing and submitting the form below. If you are looking for a specif part number, please include it with your message.